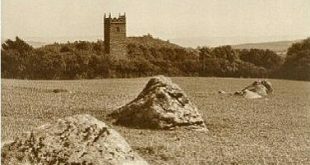 On the 1st of March 1950 the Western Morning News carried the following headline – “Ancient Devon cross found broken and buried beside farm gate.” and this was referring to the discovery of an important relic of Dartmoor’s history. As with many of the old stone crosses which once stood silent on and around the moor it clearly had been missing for a fair while. Why exactly nobody will ever know? One theory being that in the times of the Puritans such crosses were deemed as idolatrous symbols and were regarded with loathing and disdain, so much so that there destruction was ordered. On a more local level the people who were compelled to knock down the crosses had a strong aversion for destroying these ancient sacred symbols along with a deep seated superstition for such acts. So, in order to comply with the demands some crosses were destroyed but then buried, hidden for such a time as it would be possible to re-erect them. It may well be the case that those who hid the crosses died and with them the locations of the crosses died as well. It was only in later years that they were rediscovered. Anyway, for whatever reason this particular cross was saved from oblivion in 1950. Its discovery came about when Father John Stephan, a monk at Buckfast Abbey read an article written by Mr. Masson Phillips in the 1943. This appeared in the Transactions of the Devonshire Association and read; “Great Palston – At the farm entrance on the main Plymouth – Totnes road, lying outside an outbuilding within the gate on the right-hand side of the road to the farm. The head and arms of a cross of rough rectangular section with a cross with limbs expanded outwards, incised in outline on each face. The shaft has been broken off below the arms. The cross-head was found below ground in widening the adjacent gateway between the outbuilding and a low wall on the opposite side of the entrance road. The shaft is said to be still buried below the wall, and it is greatly to be hoped that it may be unearthed and the two portions reunited and re-erected.” pp.262-3. This arouse Father John’s interest but at the time the Second World War directed his attention elsewhere. It was not until early 1950 that Father John along with a party of brothers went to Great Palstone farm and with the owner’s permission began digging in search for the missing shaft. Interestingly he was told by the owner that the workmen involved in excavating the cross head flatly refused to carry on with any further digging “lest it bring them bad luck.” This comment proves that the superstition of bad luck coming to anyone who disturbs an ancient cross still lived on into the 20th century. After about an hours worth of digging the brothers finally came upon a solid block of granite which they took to be the missing shaft. When it was finally unearthed and the original head placed with it they saw with great joy that both ends were a perfect match. Having struck a deal with the farm’s owner both pieces of the cross were then taken back to Buckfast Abbey. The intention was to give them to Brother peter, the abbey’s master builder in order that he could clean the pieces and rejoin them to their former state. this task was carefully completed and the cross re-erected as a central piece on the abbey lawn where it still can be seen today. Father John had a personal theory as to the fate of the cross, he muted the idea that originally Great Palstone farm belonged to Buckfast Manor of South Brent which in turn was owned at one time by Buckfast Abbey. Therefore at the time of the ‘Dissolution of the Monasteries’ in the mid 1500s the cross may have been deemed property of the monastery and therefore should be destroyed. Was it simply ‘beheaded’ and knocked down and left in-situ only to be rescued and hidden at a later date by a religiously minded soul? Today the old cross could be classified as a ‘churchyard cross’ as it stands in the precinct of a religious establishment. But what was it’s original purpose? There is a suggestion that due to its size the cross may have served as a ‘wayside cross’ which marked the route of some ancient trackway. Certainly today, sitting in the grounds of the abbey it could be said to mark the southern end of the ancient and revered Abbot’s Way which originally ran from Buckfast Abbey to Tavistock Abbey. having said that if the cross was a wayside marker associated with the Abbot’s Way and it did originate from Palstone then it would have marked the Buckfast to Plympton monastic track? For anyone interested in vital statistics then here your go; height above ground – 98 centimetres, arm span – 57 centimetres, circumference – 1.04 metres along with a north – south alignment. Sandles p. 16. As you can see from the old photo above the shaft appears much longer than it does today but it’s worth remembering that a granite shaft weighs heavy and therefore needs to be buried deep in order to stop it falling over. Masson Phillips, E. N. 1943. Supplementary Notes on the Ancient Stone Crosses of Devon. Transactions of the Devonshire Association -vol.IXXV. Sandles, T. 1997. A Pilgrimage to Dartmoor’s Stone Crosses. Liverton: Forest Publishing.